Abstract. There is a large amount of organic carbon stored in permafrost in the northern high latitudes, which may become vulnerable to microbial decomposition under future climate warming. In order to estimate this potential carbon–climate feedback it is necessary to correctly simulate the physical dynamics of permafrost within global Earth system models (ESMs) and to determine the rate at which it will thaw. Additional new processes within JULES, the land-surface scheme of the UK ESM (UKESM), include a representation of organic soils, moss and bedrock and a modification to the snow scheme; the sensitivity of permafrost to these new developments is investigated in this study. The impact of a higher vertical soil resolution and deeper soil column is also considered. Evaluation against a large group of sites shows the annual cycle of soil temperatures is approximately 25 % too large in the standard JULES version, but this error is corrected by the model improvements, in particular by deeper soil, organic soils, moss and the modified snow scheme. A comparison with active layer monitoring sites shows that the active layer is on average just over 1 m too deep in the standard model version, and this bias is reduced by 70 cm in the improved version. Increasing the soil vertical resolution allows the full range of active layer depths to be simulated; by contrast, with a poorly resolved soil at least 50 % of the permafrost area has a maximum thaw depth at the centre of the bottom soil layer. Thus all the model modifications are seen to improve the permafrost simulations. Historical permafrost area corresponds fairly well to observations in all simulations, covering an area between 14 and 19 million km2. Simulations under two future climate scenarios show a reduced sensitivity of permafrost degradation to temperature, with the near-surface permafrost loss per degree of warming reduced from 1.5 million km2 °C−1 in the standard version of JULES to between 1.1 and 1.2 million km2 °C−1 in the new model version. However, the near-surface permafrost area is still projected to approximately half by the end of the 21st century under the RCP8.5 scenario. How to cite: Chadburn, S. E., Burke, E. J., Essery, R. L. H., Boike, J., Langer, M., Heikenfeld, M., Cox, P. M., and Friedlingstein, P.: Impact of model developments on present and future simulations of permafrost in a global land-surface model, The Cryosphere, 9, 1505-1521, https://doi.org/10.5194/tc-9-1505-2015, 2015. 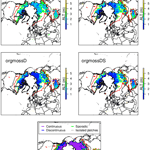 In this paper we use a global land-surface model to study the dynamics of Arctic permafrost. We examine the impact of new and improved processes in the model, namely soil depth and resolution, organic soils, moss and the representation of snow. These improvements make the simulated soil temperatures and thaw depth significantly more realistic. Simulations under future climate scenarios show that permafrost thaws more slowly in the new model version, but still a large amount is lost by 2100.